Pide is stuffed with beef or cheese and served with ajvar, a spicy roasted red-pepper relish. If you ask Loryn Nalic to describe falling in love, she isn't quite sure which story you want to hear — the time she met her husband or the day she watched his aunt make bourek. Granted, Nalic would not have met Aunt Fadila were it not for that fateful day she went to call on Taft Street Restaurant and Bar. Then a meat saleswoman for Sysco, Nalic visited the restaurant to drum up some business and ended up meeting the love of her life, Edo Nalic, who was its manager at the time. The two began spending time together, frequenting the Bosnian spots around the Bevo Mill neighborhood that Edo called home since moving to the area from Sarajevo several years prior. 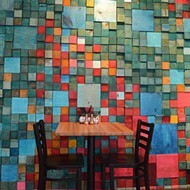 For Nalic, their blossoming love affair was also the beginning of her passion for Bosnian food. Though she'd eaten the cuisine before meeting Edo, seeing it through his eyes gave her a richer understanding that only intensified as she began spending time with his family — in particular, his father's twin sister Fadila. At Fadila's house, even everyday meals were epic events, and Nalic found herself drawn into her kitchen to soak up as much knowledge as she could. 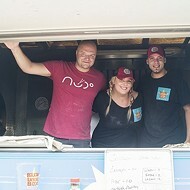 Edo and Loryn Nalic share their truck with chef Amel Rizvanovic. Nalic had known she wanted to learn how to cook Bosnian food, but when she saw Fadila make the traditional meat-filled phyllo pie called bourek, she realized she wanted to devote her life to it. Watching the joy on Fadila's face as she labored to turn flour, salt, oil and vinegar into flaky golden layers was revelatory. She left that day a woman on a mission to learn everything she could about Bosnian food and to turn that knowledge into a restaurant. She had the cooking chops to open a place of her own, having already worked in various eateries, including a lengthy tenure at Pappy's Smokehouse. However, before opening her restaurant, she knew that she had a responsibility to her husband's homeland to get it right. In 2013, she went to Bosnia where she spent two months working in restaurants and home kitchens. She came back to the U.S. more confident than ever, and got to work translating her concept into a restaurant. The Bosnian sausage cevapi is served with kajmak and ajvar on flatbread. 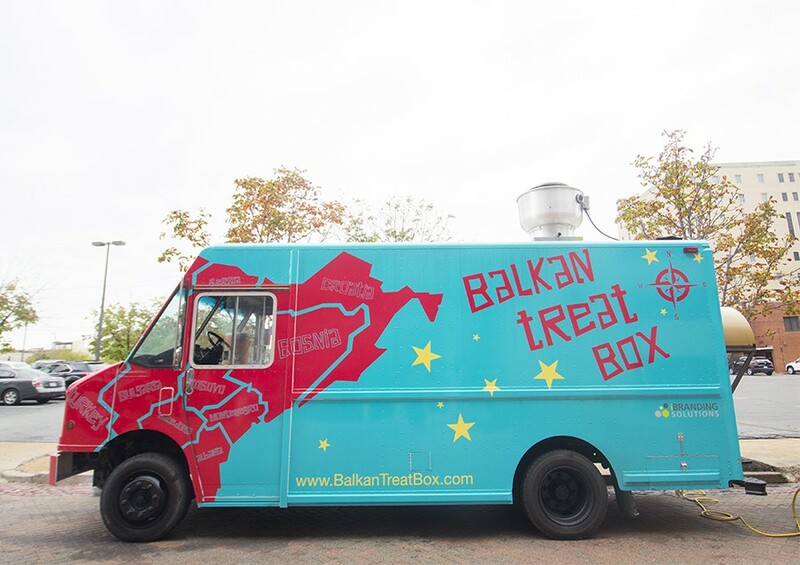 That vision would become Balkan Treat Box, the delightful red and turquoise food truck that has been rolling around town since December 2016. If the vibrant colors are eye-catching, the smell emanating from it is a siren song. 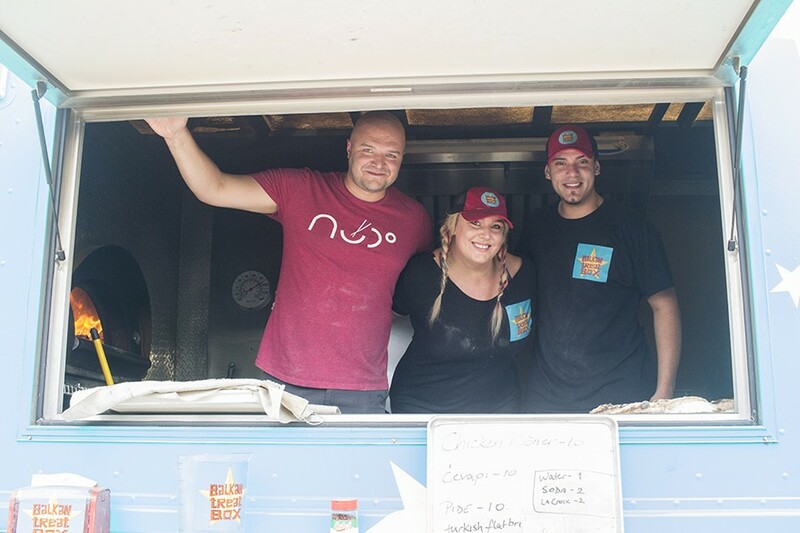 Nalic outfitted the vehicle not only with a standard food truck kitchen but also with a wood-burning pizza oven so she could cook the bread and grill the meat by fire, just as it's done in the old country. That extra effort was not wasted. 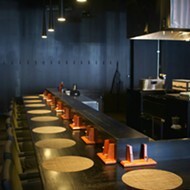 Balkan Treat Box is one of the most soulful, innovative concepts to open in recent years. 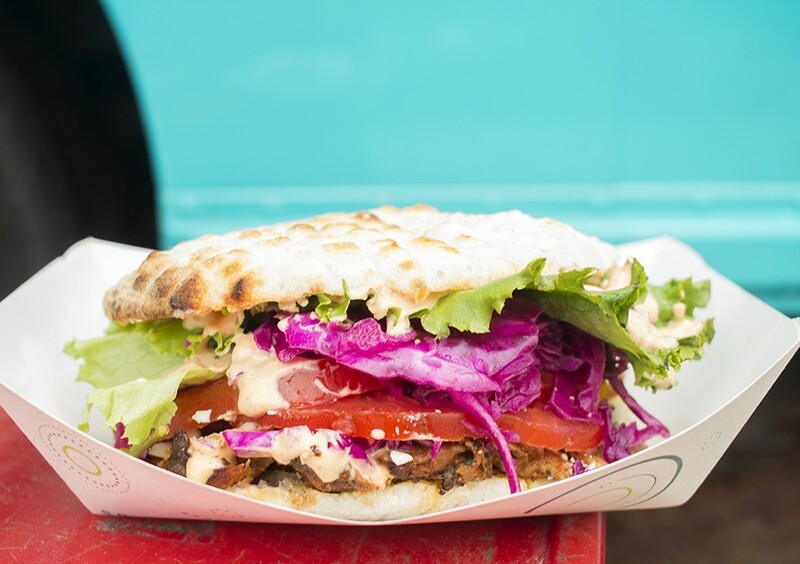 Like Guerrilla Street Food did with Filipino food, the Nalics have modernized Bosnian cuisine while still respecting tradition. Her attention to it is a long time in coming. Without question, the city has been blessed with authentic Bosnian cuisine thanks to the large diaspora that made its home in south St. Louis during the war in the early 1990s. 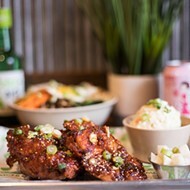 However, though the delicious cuisine has been enjoyed by that community and adventurous food lovers for decades, the Nalics are making old world, traditional dishes seem contemporary, relevant and accessible. In that, they've got much in common with Lemmons by Grbic, the restaurant opened this spring by the St. Louis-raised children of Bosnian immigrants, to equally delightful results. The striking truck is a familiar sight on city streets. Balkan Treat Box is anchored to tradition by its bread, something that Nalic quickly realized was the single most fundamental aspect of Bosnian cuisine. 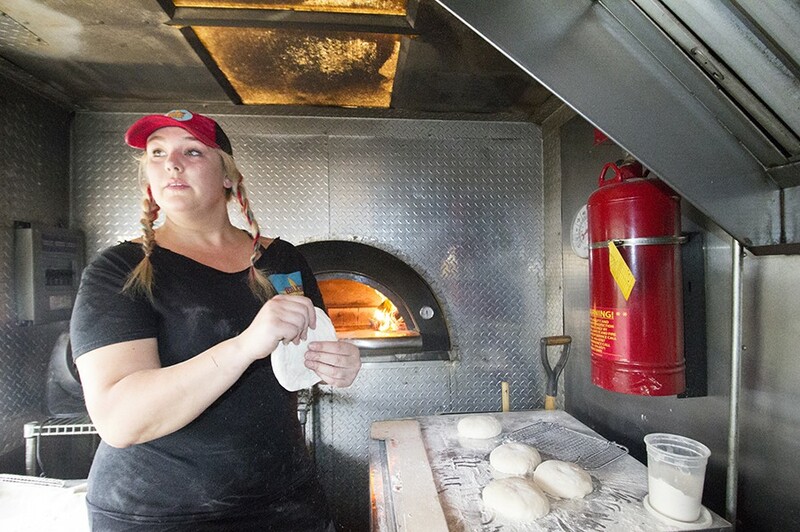 She bakes two kinds every day in the truck's wood oven, serving it so fresh, it's practically made to order: Bosnian somun, which is similar to pita, and Turkish pide, a flatbread that reads like the eastern cousin to Neapolitan pizza crust. On both, Nalic's prior work as a pastry chef shines through in outstanding breads that are good enough to be eaten on their own. You could do this, or you could order the somun stuffed with Sarajevo-style cevapi, a ground beef sausage that looks like a breakfast link but tastes more like Middle Eastern kefta. Nalic cooks the meat over open flames, encrusting it with wood smoke to give it a slightly crisp texture even as it remains so juicy you'd think it's been bathed in its drippings. 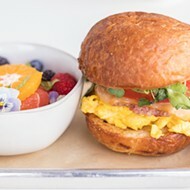 The sandwich is served with sides of kajmak — think of the cream cheese-like Lebanese dip labneh — and ajvar, which is the mild but tangy red pepper condiment that is basically Bosnian ketchup. If you haven't yet tried cevapi, Bosnian Treat Box will ruin you for any other version. Döner comes with thinly sliced rotisserie chicken, served with somun, a wood-fired bread similar to pita. You can also choose to enjoy the somun as a traditional döner kebab, which is basically the Turkish version of chicken shawarma. Marinated chicken that has been roasted on an inverted cone-shaped vertical spit caramelizes as it rotates; the Nalics shave it off to order, then dress it with lettuce, tomato, pickled red cabbage, kajmak and ajvar — meat and salad all wrapped into one delicious pita that will make you forget there is such a thing as a chicken gyro. 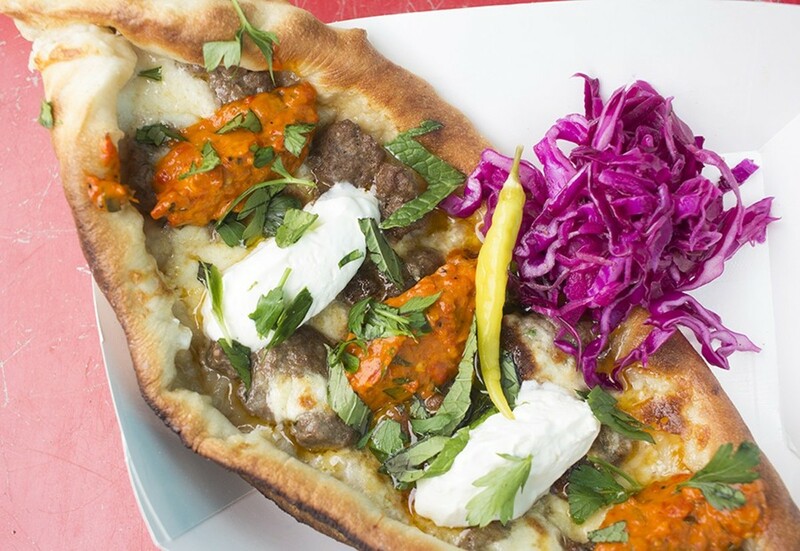 If Nalic's somun is applause-worthy, her Turkish pide is the show-stopper. In what is destined to become one of the defining dishes of the year, this magnificent bread serves as a vessel for a whole host of fillings. And by "vessel," I am being quite literal — the glorious, spongy bread, speckled with char, is fashioned into the shape of a boat, a bread-based model of a Viking ship with an elongated football shape, hollowed-out interior and upward-sloping front and back points. 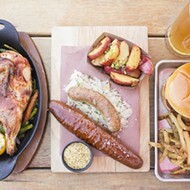 On one visit, it cradled beef brisket from a collaboration with the esteemed barbecue restaurant the Stellar Hog. The meat coated the entire bottom of the bread, festooned with dollops of colorful condiments that made it look like a boatload of jewels: vibrant orange ajvar, magenta cabbage slaw, creamy white kajmak, translucent white onions and one yellow-green spicy pepper. Its beauty is matched only by its symphony of flavor. Loryn Nalic fell in love with Bosnian food through her husband and then visited the country to perfect her technique. However, the simple comfort of the undressed cheese version of Balkan Treat Box's pide is what truly won my heart. Here, Nalic covers the entire floor of her bread boat with a mild white Turkish cheese and mozzarella blend. The cheese bakes into the bread so seamlessly, it's hard to know where one begins and one ends. You can top this masterpiece with any of the condiments on offer, but for my money, that would be like bedazzling the Mona Lisa. It's perfect as it is. 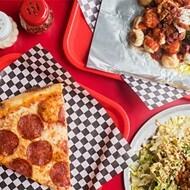 The only issue with the pide — and really all of the offerings at Balkan Treat Box — is that they are difficult to eat by hand. A small complaint, but since this is a food truck, it definitely bears noting. I'm not sure if you are supposed to grab a fork and knife and cut into them (probably) or eat them sans utensils as a sandwich. I opted for the latter and ended up looking like I was devouring my food with the ferocity of someone kissing the love of their life for the first time. 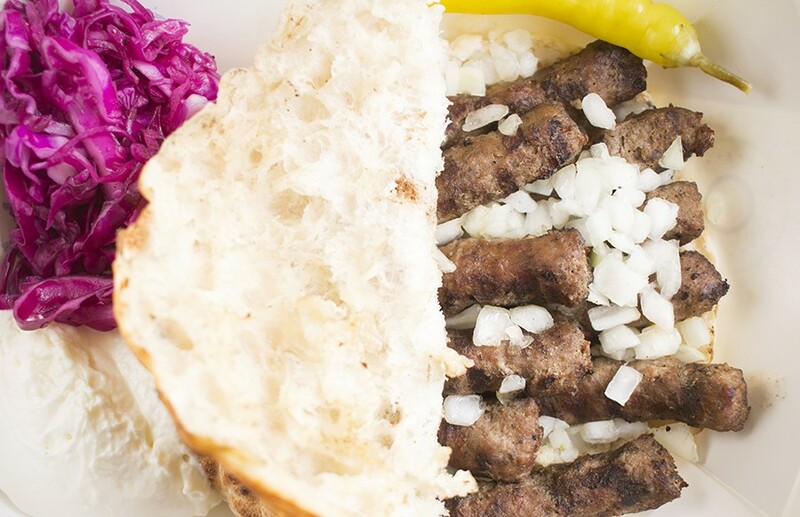 That's the thing about Bosnian food — and about Balkan Treat Box in particular. It makes you fall head over heels in love.